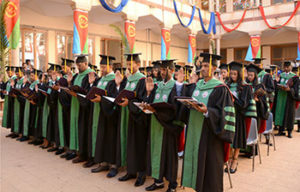 In its eight commencement the Orotta School of Medicine and Dentistry today 12 January graduated a total of 57 Medical Doctors, including 43 in General Medicine and 13 others in Dentistry. Speaking at the graduation ceremony, Ms. Amina Nur-Husien, Minister of Health, pointed out that owing to the persistent endeavors undertaken aimed at ensuring effective and quality health services, Eritrea is registering major progress in the health sector. Ms. Amina further called on the graduates to serve the public with dedication following the footsteps of their predecessors. 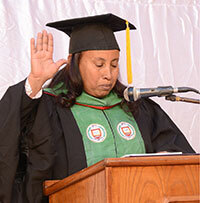 Also speaking on the occasion, Associate Prof. Yemane Seyoum, Dean of Orotta School of Medicine and Dentistry, indicated that since its establishment in 2004 the School has graduated 285 in General Medicine and 35 in Dentistry and that has decreased the ratio of one doctor to 37 thousand patients during the first years of independence to one doctor to 16 thousand patients to-date. A representative of the graduating batch commending for the support the Government, parents as well as instructors displayed during their stay in the school asserted readiness to serve the people and Government with higher dedication.